1618 Vista Del Mar reads a hand-written note tacked to the bulletin board above my desk. I only write notes by hand. I had a roommate once who would type notes – reminders, to-do lists, quotes – and then color childlike borders on them with markers before she’d tack them above her desk. A typed, designed note is no longer a note, just as a painting, scanned, printed and rolled into a tube mailer is no longer a painting. The nature has been steamrolled out of it, and now it’s just a poster. 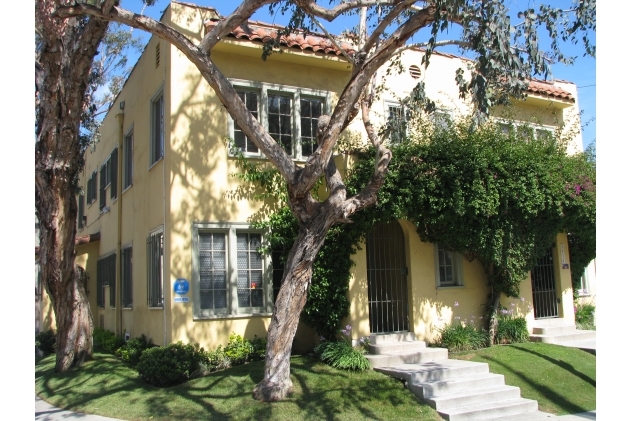 I learned two years ago that when my grandmother gave birth to her first child, my mother, she lived in a building at 1618 Vista Del Mar, right down the street from where I live now. The fact that my mother’s first home on earth was in Hollywood, just a few minute’s walk from the apartment where her daughter would live over a half century later is amazing to me. We’re from Utah. We know mountains and rivers and snow. Hollywood, City of Dreams, with its constant din of noise and light, its coyote-filled hills, its imported cars and palm trees, A-list Lounges, and sordid motels, is not our territory. It’s been so printed and re-printed, it’s like a poster that you can walk around in. Yet, as it turns out, we’ve got roots here. My grandmother, going into to labor with my mom, took the bus by herself from her apartment to the hospital on Mid-Wilshire – that’s putting down roots. Below the scrawled 1618 Vista Del Mar note is a blue leather desk organizer, from which stretches a stack of medical bills. I relegated them to the back of the organizer as I’d hoped to do in my mind, but I stood them upright so that I wouldn’t forget the thing one must remember about bills – to pay them. Every time I look at them, I tell myself that I ought to organize them, pay those remaining to be paid, and file them away for good. But there they stand. I may be residing in a city of dreams, but life doesn’t know it. After all, I’ve got roots here: in front of the medical bills grows a cluster of journal entries that I wrote during my treatment for thyroid cancer. I’ve been tearing the entries out of the journal, because its pages are graphed, and I can’t stand writing on such regimented lines. I’ve been saving them in the organizer, where they obscure the bills. Their edges are torn and frayed, having had a difficult time releasing from the bookbinding. I’ve always had a soft spot for torn paper with its sharp edges turned cloudy. My notes, in addition to being hand-written, are usually scrawled upon torn scraps, their imperfect form reminding me of nature – of mountains, rivers, and snowflakes tacked to the bulletin board above my desk in Hollywood. After living here for two years, I’d grown to like the neighborhood for its contradictions and justifications, but learning of the nearness of my mother’s infant years caused me to love it with a fierce protectiveness. Finding the actual building in which she had lived, still tucked behind that sprawling parking lot south of the sidewalk that is tiled with celebrity names, under the unremitting lights of Hollywood and Vine, was a real full-circle moment. My adoptive city was no longer adoptive – it was a part of me, and while navigating its roads from hardship to health, I had become a part of it.